PLEASE BE AWARE OF THE QUICK TURN AROUND TIME FOR THIS SWAP. 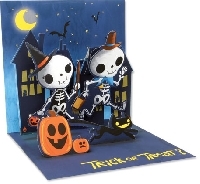 For this swap you will send your partner a store-bought Halloween greeting card. Since most greeting card swaps require you to send a 5" x 7" Halloween card, this swap is for smaller cards. You usually find the smaller cards in packs of 6 at Walmart, Target, etc., but your card doesn't have to be out of one of those packs...it can be any card that is smaller in size. I have some that I bought at Target last night that measure 4" x 5 1/2" so any card that measures around there...a little smaller or larger is fine. If you want to join in on this swap, but only have larger sized cards, that is OK too, but please know that you will probably be getting a small card in return. Please write a nice Halloween themed note, quote, joke, poem, words of wisdom or anything else you like written inside. RULES: NEWBIES OK! No recent or unexplained 1's or 3's. Must have a good swapping history & a well filled out profile. Please be aware that I check participants VERY THOROUGHLY before assigning partners. If you have a concern about someone who has signed up please let me know privately.